Day six of loving the skin we are in ~ zen inner dog? Today in this powerful wavespell we are in lovers land of balance and harmony. This is the nature of the number six in the fool’s journey with the tarot. Today we may be feeling very very much in harmony and wanting to languish in this place…. or our inner dog may be snarling……. The emotional mind is the world we share with our canine companions and the mammalian world. We also have a reptilian aspect which is the starring role in the Red Serpent Wavespell we are coasting along with for another nine days. and then our breath can be tailor- made to suit our focus and the outcome we want. We cannot hide it from our body though as it always comes out somewhere. When we breathe in a breathwork way it can be very powerful to release unconscious trauma that is held in our body . I have experienced this holistic practise several times with amazing results of revisiting my past…. without any knowing that I would do so. All I had to do was lie down and breathe in a certain way. Everything came up that sought release and left my body. they seem to be a very key member of the family. In the past I have had dogs but now I have cats instead and my Siamese are a combo of cat and dog with their behaviour. You don’t see many people walking their cat on a lead . and it was truly a sight to behold. We laughed at the power struggle between the cat and it’s companion . A cat cannot be bought unless it is on the edge of survival …..
it is an independant soul who lives alongside people and yet retains it’s own independence…..
unlike a dog who has a very different persona and unless it knows it’s place and is well trained often becomes the alpha leader and dominates the household. Dogs are always the image of their owner and share their energy space and as such their illnesses . In the wild animals do not have that same pre-disposition and they learn human traits when they join our family. Each pet in the household aligns with an individual . Cats have the opposite energy to humans and help us unwind. They represent female energy and dogs represent male energy. It’s fascinating to watch how we can clearly see the emotional side to the person being revealed through their best furry friend. The amygdala is the part of our brain that is responsible for our inner dog. When we work with this part of our mind with an intention we are working with our fight, flight and freeze. This is triggered by pattern matches. I use Emotional Freedom Technique or tapping as it is often called, to create change by working with this part of our inner dog world. It doesn’t use logic which is why EFT works really well to work with the inner dog which is also our inner child. because it speaks in a different language. Our inner dog is the wonderful place of our enlightenment and shows us where we are in balance or not…. If we are showing unconditional love…. only because it is what we learned to do to keep ourselves safe as a child. Now we have other ways open to us …. 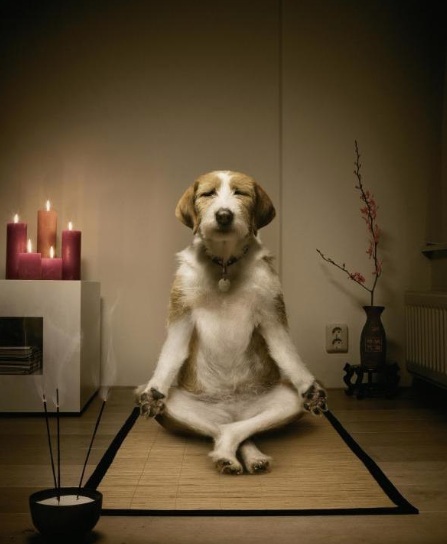 We create our zen within…..
next time you see a dog misbehaving…..
see beyond into the world of projection of the owner. Sharing love today in our balance place. If you would like to experience tapping with me here I am.